Larco Engineering service, repair & supply brand new steel sliding doors throughout Ireland. Larco Engineering supply, install, repair and service steel sliding doors for industrial and commercial premises throughout Ireland. 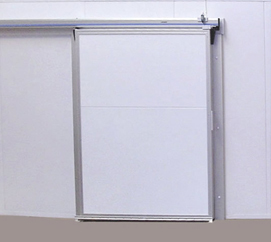 Our range of hygienic sliding doors consists of a light duty, heavy duty, extra heavy duty and meat rail sliding door. Our sliding doors can be supplied to suit ambient, chilled or freezer environments such as food process and preparation areas and cold storage distribution. Our doors are available in a large number of different sizes to suit all clients needs. There are also a number of different options available with our steel sliding doors such as locks and vision panels, automation and alternative track systems including stainless steel. Contact Larco Engineering today to discuss your steel sliding door needs.